Last year we blogged on the media hype surrounding the supermarkets' Christmas adverts, which took place in early November. A similar pattern has developed in 2015 with the major supermarkets once again competing for the media's attention as they launch the lucrative Christmas campaigns. Department store John Lewis has created a formula for maximising its profile in the Christmas advert wars. It records a new version of a popular song, spends millions on slick TV production and aims to make the country cry. The Man on the Moon features a young girl that sees an old man, seemingly alone on the moon and decides to send him a Christmas present. John Lewis claims it reminds everybody to look out for the elderly in the festive season. Launched on 6th November the advert generated huge social media profile as well as significant interest from the traditional media. According to Nexis Analyser, the media analysis tool in the LexisNexis' media monitoring database, more than 250 articles were written on that one day about Christmas adverts and, as you will see in the chart below, John Lewis was mentioned in more than 150 of these. Amongst the competitors, Sainsbury's and Marks & Spencer also invest heavily in iconic adverts and both enjoyed an increase in exposure thanks to John Lewis' launch. Tesco, a company that has recently shied away from the battle of big advertising budgets, was hardly mentioned. Arguably the most creative recent Christmas adverts have come from Sainsbury's. Last year the company marked the 100th anniversary of the First World War in partnership with the British Legion. This year the company resurrected Mog the Cat, a former favourite from the children's book by Judith Kerr. Sainsbury's waited until one week after John Lewis to unveil its advertisement and whilst media interest in the subject did rise again, it did so by very little – less than 30 articles on the day of launch. Comparing the media's response to the Christmas adverts in 2014 and 2015, demonstrates how media interest can wax or wane depending on circumstances. In 2014 the media's interest in the Christmas advert battles lasted around a week and the number of press articles was sustained throughout. Interest in 2015 was focussed on one single day. This could suggest a reduction in media interest overall but it is more likely to be related to other major news stories. A combination of the war in Syria and the downing of a passenger jet leaving Egypt bound for Russia focussed the news agenda away from advertisements quickly. This is likely to have also impacted media focus on the Sainsbury's advert. By the time this launched the terrorist attacks in Paris had taken place, throwing sharp focus away from trivia. This might help to explain how Sainsbury's received a higher media profile at the launch of John Lewis' advert than its own and demonstrates that media engagement always depends on circumstances beyond the control of even the largest brand. Of course media interest does not always equate to public interest. Currently both advertisements have received roughly the same number of views on YouTube, despite the Sainsbury's advert being launched one week later than John Lewis' effort. What any of this means for Christmas sales is anyone's guess? Look out for a blog on that in the New Year. 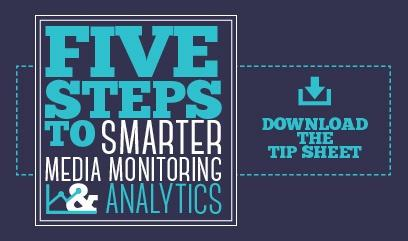 Meanwhile, why not check out our free tip sheet - 5 steps to smarter media monitoring and analytics. Halloween – A great British holiday?